New Report: Fundamental Real Estate Shift in the U.S.? The EPA's new report asks whether the U.S. real estate market is making a fundamental shift toward more urban living. Photo by Willamor Media. Residential construction in urban neighborhoods has accelerated over the past two decades, says a new report from the U.S. Environmental Protection Agency. The 2010 edition of Residential Construction Trends in America’s Metropolitan Regions foresees a fundamental shift in the real estate market driven by changing demographics, increased demand for homes in walkable communities and lower crime rates in central cities. Specifically, the report found that, in several regions, there has been a dramatic increase in the share of new construction built in central cities and older suburbs. The analysis utilized U.S. Census data showing residential building permits in the 50 largest metropolitan regions from 1990-2008. The number of permits issued by central cities and core suburban communities was compared to the number issued by suburban and exurban communities. New York City saw its share of regional residential building permits go from 15% in the early 1990s to 48% over the past six years. The City of Chicago’s share of regional permits rose from 7% to 27% over the same period. Portland, Ore. went from 9% to 26%. 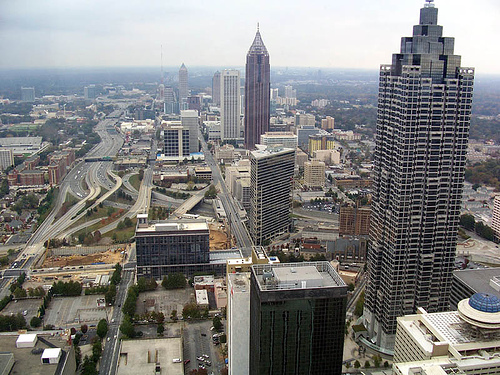 Even Atlanta, Ga. the poster child of sprawl, went from 4% to 14%. The central city share of new residential construction in metro areas whose core communities saw a substantial increase. Graph: EPA. However, the report stresses that these shifts in residential construction patterns are not occurring evenly across the country. A number of major cities, including Boston, Philadelphia, Minneapolis & St. Paul, Washington, D.C., Baltimore and Atlanta, saw substantial increases in permits, but the central city still represented less than a fifth of regional permits. In other cities, like St. Louis, San Jose, Pittsburgh, Salt Lake City and San Diego, there was little change in the share of new construction taking place in the central city. 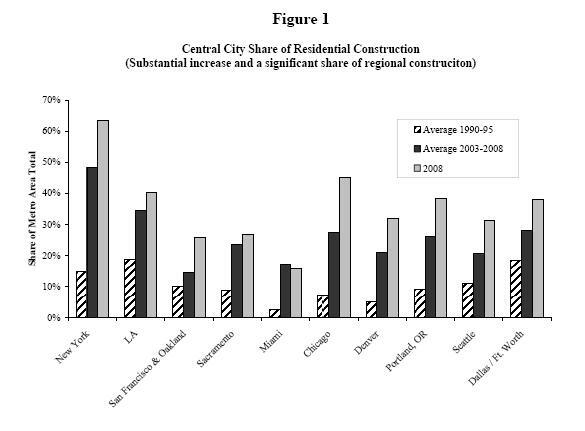 Although urban core neighborhoods have doubled or tripled their share of residential construction since the early 1990s, they still account for less than half of all new residential units in most regions. Interestingly, the data from 2008 (the most recent year available) shows the inward shift continuing during the economic downturn, even though the overall number of permits is down in nearly all jurisdictions. It will be interesting to see if this trend has kept up in 2009 and 2010, given a possible resurgence in suburban migration due to low housing and transportation costs. The authors also note that urban redevelopment projects are capital intensive, and the reduced availability of credit and municipal bonds may begin to reduce their pace. The fledgling back-to-the-city trends reflected in the report have important implications for smart growth advocates. For one, medium-sized cities with advanced growth management and urban infill policies saw more dramatic shifts inward. Whether more city-centric development patterns continue through the recession or not, policymakers who want to encourage them should strengthen their smart growth programs and review the impacts of their land use and transportation policies and practices on where growth occurs. Local regulations and public infrastructure investment priorities can discourage large-scale redevelopment projects. For example, transit-oriented development often requires updates to zoning codes, more flexible parking regulations, assistance with land assembly or improvements to water, sewer and streets. Municipalities that do not attend to these issues may see continued suburban sprawl and will not meet the growing demand for walkable, transit-friendly living environments in the decades to come.